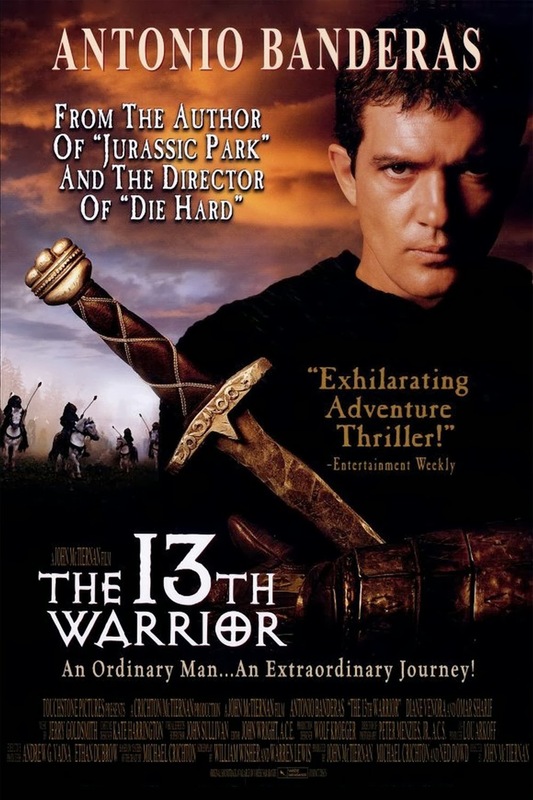 Most reviews of John McTiernan’s 1999 film The 13th Warrior encourage prospective viewers to stay as far away as possible. Their warnings would usually echo some discontent with the plot—with critics such as Roger Ebert and Todd McCarthy asserting that the movie displayed “little thought” and an “underdeveloped story.” Others dismissed the film as cheesy and unexciting. Reading such reviews, I was not at all thrilled to begin this assignment. To my surprise, however, The 13th Warrior was an entertaining film that derives its basic plot from Beowulf. Although there are many differences between film and poem, the film provides a character development for its main characters that is not found in the poem. Buliwyf, the cinematic version of Beowulf’s namesake, is not even the only main character since his companions are developed as individuals as well. While the critics dismissed the plotline as underdeveloped, approaching the film with knowledge of the original poem allows for an enjoyable experience. Knowing the poem and then watching the movie will allow people to fill in a visual representation of their textual characters. Additionally, knowledge of the poem allows viewers to easily pick up on differences in the plot line, which itself provides sufficient entertainment. The 13th Warrior does not begin in the Anglo-Saxon world but rather Arabia. We are introduced to the main character, Ahmed Ibn Fahdlan (Antonio Banderas), and his misfortune. Ahmed loves a married woman and her husband finds out. Displeased with the unwanted attention, the husband arranges for Ahmed to be exiled and sent as a diplomat to a far-off land. It is on his journey to this land that Ahmed comes across Buliwyf and his men. Buliwyf is shown to be quite different from his poetic counterpart. He drinks heartily, stumbles while walking, and talks loudly—in contrast to Ahmed who is reserved and abstains from drinking. While Ahmed makes camp with Buliwyf’s men, a messenger arrives from King Hrothgar’s realm seeking Buliwyf’s aid. Buliwyf quickly agrees to help—not to further his own fame but out of a desire to help a suffering people—and proceeds to consult an old bone oracle. As opposed to Beowulf, who boasts of his future victory to Unferth and Hrothgar, Buliwyf and his men are visibly affected by the message describing the enemy; they are scared and not at all confident about the battle’s outcome. Buliwyf agrees to help Hrothgar, whose villagers suffered from death and destruction, though Buliwyf has no personal incentive to help Hrothgar. Treasure-giving is not demonstrated as an important ritual in the cinematic world and Buliwyf’s own kingdom is not threatened. Instead, he agrees to help upon learning of the terrible conditions under which people are living because of the threat. Unfortunately for poor Ahmed, the old crone insisted that Buliwyf take thirteen men with him and the thirteenth had to be a foreigner. Ahmed is forced to join the band and become the movie’s namesake. It is in this quest to help Hrothgar that the film accomplishes an extraordinary feat: it makes Beowulf, or at least his cinematic rendition, look human. It turns out that Hrothgar’s kingdom is besieged by an ancient and evil race, the Wendols. Hrothgar has a very poor kingdom with very few able-bodied men. Consequently, the Wendols have been dominating the humans. 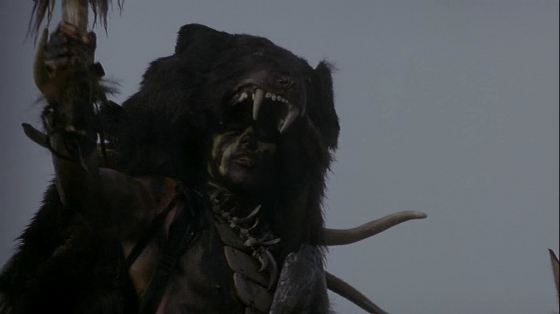 The Wendols, like Grendel, are “old and descended out of evil,” but they consist of an entire tribe of savages wearing bear-like outfits as opposed to Grendel’s relatively solitary existence. This difference may serve as to parallel the thirteen warriors who ride in to aid Hrothgar. That is, the poem focuses on Beowulf (his Geat companions, while mentioned, are not really developed) and sets up Grendel as a singular representation of evil; the eventual conflict between Beowulf and Grendel is effectively a one-on-one death match. However, in the movie, there are a number of characters who rely on each other to prevail. Buliwyf’s gang is often shown joking around (often at Ahmed’s expense) and aiding each other in battle—with unique individual skill sets such as archery and swordsmanship—which depicts a camaraderie that was absent in the poem. Similarly, the Wendols also work as a group and represent a unified threat to parallel the unified heroes. In the initial encounter between Buliwyf’s gang and the Wendols, the sheer number of Wendols causes great difficulty in battle. This shift from a single hero and enemy to multiple heroes and enemies allows for a more interesting battle sequence than an otherwise predictable and isolated death match. Viewers become invested in the well-being of the heroes and, therefore, throughout the battle, keep an eye out for the individual warriors’ activities as opposed to being focused only on Buliwyf. When Buliwyf arrived with his band of warriors, I half expected a rout of the Wendols similar to the overwhelming defeat of Grendel. Buliwyf, however, does not seem to have the strength of thirty men in his hand-grip as he struggles with the Wendols. Even so, he displays perseverance and skill with his sword to mount an effective defense against the creatures. This initial battle, however, was no easy victory for Buliwyf. As mentioned before, his gang has problems dealing with the sheer number of Wendols, which makes Buliwyf seem more like a human warrior than a superhuman entity. He also demonstrates an attachment to his men that Beowulf never really shows in the poem. Buliwyf goes out of his way to protect his men from a Wendol sword or spear. In addition to caring about their well-being, Buliwyf values his men’s opinions and learns from them. Indeed, while travelling with Ahmed, Buliwyf takes it upon himself to recite and write phrases of Arabic. This Arabic twist to the original plot of the poem derives from the basis of the movie: Michael Crichton’s Eaters of the Dead. Crichton’s novel is a combination of two different sources: the actual Ibn Fadlan’s tenth-century account of his observations of Vikings and the Beowulf poem. Crichton offers a disclaimer that despite the historical basis of his novel, the overall plot is intended to be fictional and offer entertainment value. However, despite Crichton’s intention, introducing an Arabic element into the plotline of Eaters of the Dead and the 13th Warrior brings out a cultural clash that was present in Beowulf as well. In the original poem, there is tension between paganism and Christianity. For instance, the Danes are described as having “paid homage to idols and prayed aloud to the slayer of souls,” (173-74) despite Grendel’s background as a descendant of Cain, a story from the Judeo-Christian tradition. Paganism did not lend to the success of battles in the poem, as what appears to be the Christian God would be the entity to eventually award victory. Such was the case when God prevented Grendel from enjoying Heorot’s treasures and when “the wise lord awarded victory in battle” (1564) to Beowulf versus Grendel’s mother. Whereas paganism is minimized by Christianity in the original poem, the film allows the two different cultures to benefit each other. Throughout the movie, Ahmed’s Muslim identity is rather explicit: he teaches Buliwyf the Shahadah, there are frequent references to Arabic culture, and we are shown a scene where Ahmed is praying to Allah. After the initial battle with the Wendols, Buliwyf and company quickly realize that the only way to ensure their security was to defeat the Mother of the Wendols. 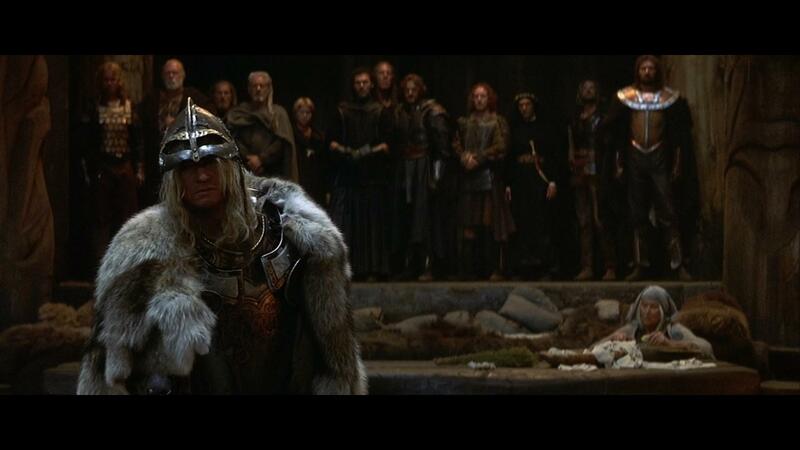 This defeat is ultimately attained after a series of action powered scenes (when it was released in 1999, this movie was considered particularly advanced in terms of special effects) but a particularly striking scene was when the band of warriors, facing down their potential deaths, stand together and utter a Viking prayer. Buliwyf and his men passionately chant their prayer, and Ahmed, surprisingly, joins in. This scene, then, accomplishes two things. First, it comments on the growth of the bonds between the men (sure enough, there was an interlude of dramatic music which featured a brief camera focus on each person). Secondly, it reminds the reader of the cultural difference between Ahmed and the Northmen, which may have taken to the background in the midst of all the action. This cultural difference throughout the movie has allowed for the growth of individual characters. Indeed, in the beginning, everyone would readily dismiss Ahmed’s way of life but throughout the movie, the Northmen seem to learn sophistication; Buliwyf, for instance, learns how to read and write certain Arabic phrases. Of course, there was an impact on Ahmed as well, who attains courage and becomes battle-hardy as a result of his acquaintance with Buliwyf. Despite the negative reviews, The 13th Warrior was an entertaining film that also served as an effective visual representation of the Beowulf saga. Indeed, despite the differences that existed between film and poem, we end up ultimately gaining insight into characters as the film develops Beowulf and his gang to an extent that is unseen in the poem. Buliwyf, for instance, never enjoys superhuman capabilities and is represented as a human, which makes him easier to relate to. Beowulf, for instance, had the strength of thirty men which, from Grendel’s perspective, was “a stronger hand-grip from any other man in this world.” (717-18). As a result of this superhuman strength, Beowulf immediately and overwhelmingly overpowers his foe, draining much of the interest from the conflict. The Grendel fight may have been entertaining for some readers but, for me, the fight is too one-sided to be enjoyable. Buliwyf, in comparison, does not defeat the Wendols. He struggles with the sheer population of the creatures, which leaves at least some doubt as to the outcome of the conflict. This allows watchers to root for him to a greater extent than Beowulf who does not need any outside help. Buliwyf relies on his band of warriors, which allows them to develop as characters and contribute to the dialogue of the film. He also does not enjoy the ego that Beowulf seems to have, which makes Buliwyf a much less frustrating character to follow. Development of characteristics such as compassion and literacy really sets Buliwyf apart from Beowulf. This humanistic portrayal of Beowulf in this movie makes for an entertaining two hours for both individuals who are familiar with the saga as well as those who are simply seeking for a decent film to watch. Be warned, or perhaps be eager, there are a fair number of scenes that are filled with cheesy special effects and action. At any rate, I urge Beowulf aficionados to watch this movie and allow their selves to enjoy a riveting retelling of the original plot. –Yaseen Morshed ’16 is an English major at Grinnell College. He spends his time performing spoken word and drinking tea.